AGTER - World hunger : one billion, or more than two billion people ? Figures of world hunger published by FAO in 2012 were no surprise. They remain high in developing countries, but seem to have been decreasing slightly for 20 years. However, reading the annexes to STATE OF FOOD INSECURITY, one becomes aware of the uncertainty of these data. In this short article, the author notes that the FAO has changed and refined last year its methodology concerning world hunger assessment. Based on the annexes of this same report, Frederic Dévé observes that the current estimate of 870 million undernourished people is probably much lower than the reality, which could be that actually between 1,5 and 2,5 billion people are hungry! While we approach 2015, target year for achieving the Millennium Development Goals (MDG), these are numbers that should make headlines and make us all think. Always read the annexes of the reports and look what were the methodologies used. Uncertainties on the magnitudes of the phenomena being studied are sometimes considerable! And yet… an important observation should be made. The methodology used in the 2012 report has indeed been adjusted. Among its innovations, there is one that deserves particular attention because it provides a basis for challenging the figures retained and distributed, and the (very relative indeed) optimism that prevails as far as the Millennium Development Goal N°1 is concerned. In the 2012 SOFI report, it is an index of the prevalence of inadequate food that was used, rather than the old index of chronic deprivation of food. 2) the caloric threshold chosen can now be differentiated depending on the energy needs of three different lifestyles: moderate physical activity, vigorous, and vigorously active lifestyles. And it is according to each of these three lifestyles that the index can now measure the percentage of the population and number of persons that possibly do not satisfy their food needs. The fact is that the estimate of 870 million which was largely repeated in the Press is an estimate that relies on the conservative (and questionable) assumption that undernourished persons have a sedentary lifestyle which corresponds to an energy requirement of 1,55 times the basal metabolic rate (energy requirement at rest). However, if one refers to the FAO/WHO norms defined in 2001, this level of physical activity corresponds to one that does not demand much physical effort, similar to that of urban dwellers spending a large part of the day seated or standing «with little body displacement (e.g. talking, reading, watching television, listening to the radio, using computers)». An agricultural worker, who relies solely on his/her own energy to cultivate, fetch water and fuel wood (this is the lot of most of the poor farmers who constitute the overwhelming majority of those who suffer from hunger and malnutrition) should be classified under the category of people with a vigorous or vigorously active lifestyle, which corresponds to 2 to 2.4 times the basal metabolic rate. 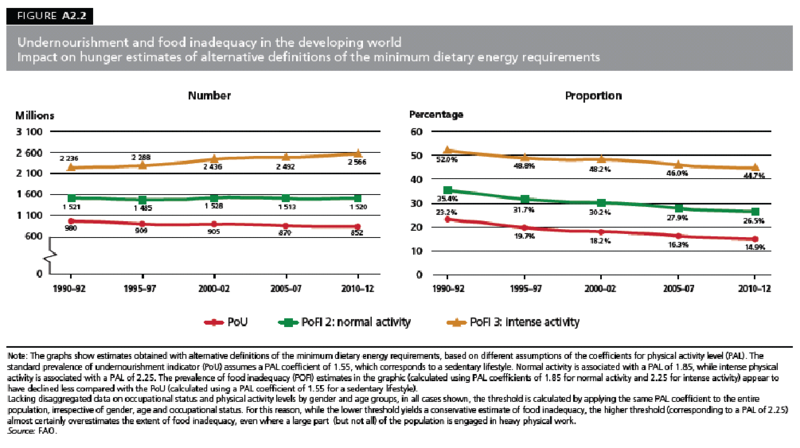 Annex 2 of SOFI shows that if one were to consider that energy requirements corresponded to an intense level of physical activity, the estimate of the number of under-nourished would be more than 2.5 billion people. Moreover, as the graph in the SOFI Annex shows, this figure has been increasing regularly since the beginning of the 90’s, instead of declining (see below). It is therefore quite likely, unfortunately, that the real number of hungry persons in the world is greater than 1.5 billion, and it is also probable that this number is stable or slightly increasing, rather than following a decreasing trend as suggested by the FAO report. Translated from French by Audrey Falzone in link with the author.